The adrenal glands are important little glands that sit atop the kidneys. They secrete the hormones that maintain blood sugar, blood salt, and energy levels during periods of stress. But because they are so small, there is a limit to how hard you can make them work and how long they can maintain their function under stress before they become depleted. There are a number of things that can occur when the adrenal glands become exhausted from frequent or prolonged periods of stress. We’ve all been tired on occasion for identifiable reasons – that book was just too good to put down even though it was late at night, you were up half the night because the baby was fussing, or the neighbours were whooping it up until the wee hours. But when we say “fatigue”, we mean the chronic and unremitting feeling of being tired despite just having had seven or eight hours of sleep. That could be caused by adrenal exhaustion. Depleted adrenal glands simply cannot generate enough energy to keep you going. And fatigue is not simply a matter of feeling tired, although that’s unpleasant enough. Other symptoms of fatigue can include headaches, dizziness, muscle weakness, brain fog, and a host of other undesirable conditions including depression and anxiety. Depleted adrenals will rob other tissue of the progesterone they need. 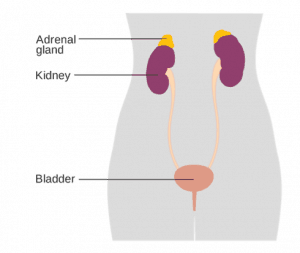 In women, the adrenal glands will literally take progesterone from the ovaries. The main function of progesterone in women is the smooth operation of the reproductive system. This “theft” of progesterone by the adrenal glands can cause any number of symptoms that make the natural process of menstruation absolutely miserable for some women. The tenderness, the bloating, the water retention, the irritability, the mood swings, the insomnia can all stem from adrenal glands that are depleted and not functioning properly. Adrenaline production is significantly reduced. Adrenaline is one of the few substances in the body that literally burns fat. Cortisol production is significantly increased. Cortisol is the main hormone to maintain blood sugar and it also stimulates fat storage. Additionally, when your adrenal glands are exhausted, you can start to crave sugar and salt. With little or no fat-burning adrenaline being produced in combination with an overabundance of fat-storing cortisol being produced, and with sugar and salt cravings kicking in, weight loss becomes next to impossible if your adrenals are overtaxed and burned out. Depleted, exhausted adrenal glands will compromise the body’s natural processes and functions. But there are safe, natural treatments that can remedy this situation. A consultation with your naturopathic doctor can get you on your feet again and on the road to recovery and enjoyment of life. Call us at (780) 485-9468 today for an appointment. Click here for the downloadable version of this article.